Don't be fooled by its size and ultra-portability, the IRIScan Anywhere 3 Wifi is the most powerful battery-powered scanner on the market today. 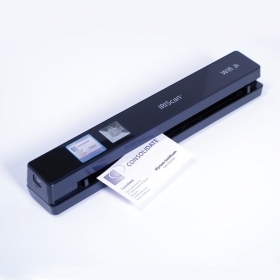 It will scan your desk clean in no time thanks to a stunning 12-pages per minute scanning speed. Store your scans into the provided MicroSD card or on any standard MicroSD card you already own (up to 32GB supported for thousands of scans in the palm of your hand!) Whether you are at home or at the office, on a plane or at a conference, the IRIScan Anywhere 3 Wifi is perfect for scanning just about anything, anywhere and frees you from documents piling up. As paper slips right through the sheet-fed scanner, scans are saved automatically into the built-in memory and ready to be sent via Wi-Fi to your smartphone, iPad, iPhone, Android tablet, Windows or Mac computer. Even better, dedicated easy-to-use iOS/Android apps are available online to facilitate the Wi-Fi transfer to your mobile device! Readiris 14 lets you create compressed and searchable PDF files compatible with virtually any computer. The produced PDF will look exactly the same as the original scan, but its size will be up to 5 times smaller and a text layer ready to be searched will be added. It is now very convenient to find the exact information you are looking for amongst tons of archives, and the size of your digital documents will no longer be an issue while being stored or shared! The IRIScan Anywhere 3 Wifi also lets you quickly scan the stack of business cards you have been collecting for so long, or right on the spot when you meet a business partner at a trade show or in a meeting. You can then automatically extract all their data with the provided business cards recognition software Cardiris, and export your digital contacts to Outlook, Excel, Salesforce, ACT!, and more. Lightning-fast and easy to use, the IRIScan Anywhere 3 Wifi also enables on-the-go users to digitize and share their old printed photos with friends and family. So go get those shoeboxes full old photos, scan them into the scanner's microSD card, insert this card into your digital photo frame and take a trip down memory lane!